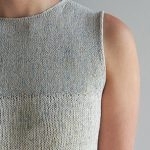 Julie Hoover is back with another how-did-I ever-live-without-it sweater! 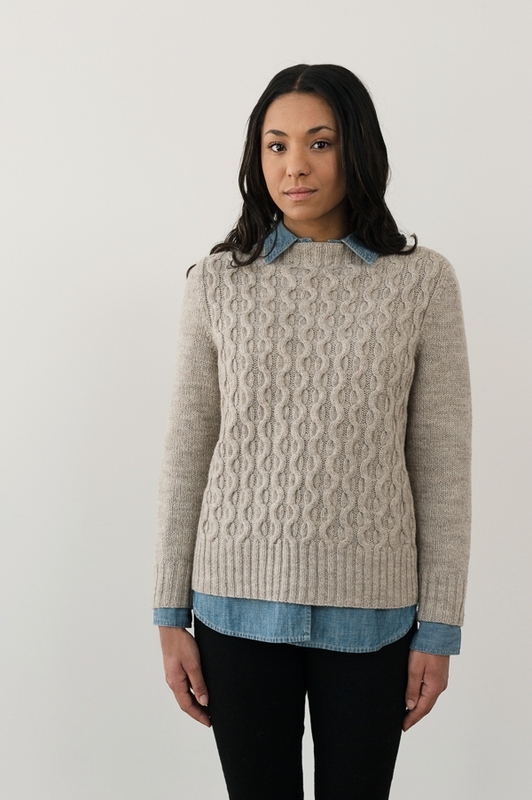 This time it’s her beautiful Hawley pullover, designed just for Purl Soho. 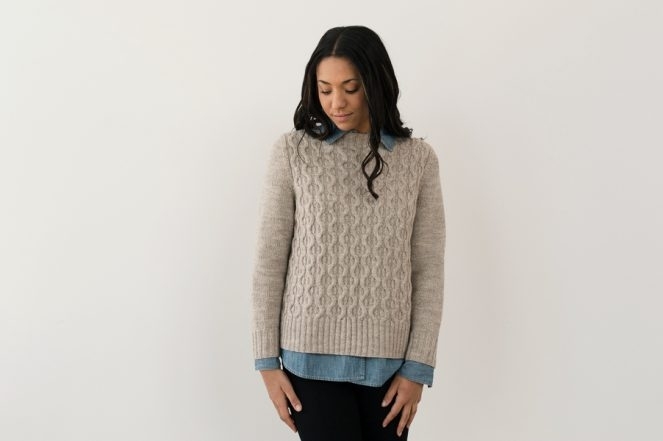 Everything about the Hawley is thoughtfully designed for ease, from its simple stitch pattern and intuitive construction to its flattering fit. 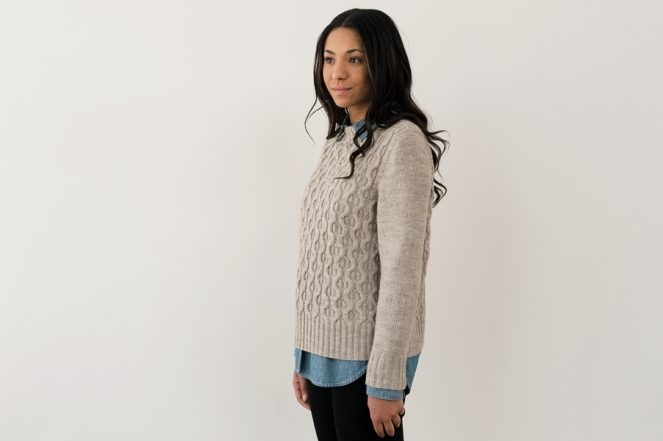 Knit in pieces and then seamed, this is a wonderfully uncomplicated pattern that will challenge beginners and keep experienced knitters interested… The perfect balance! 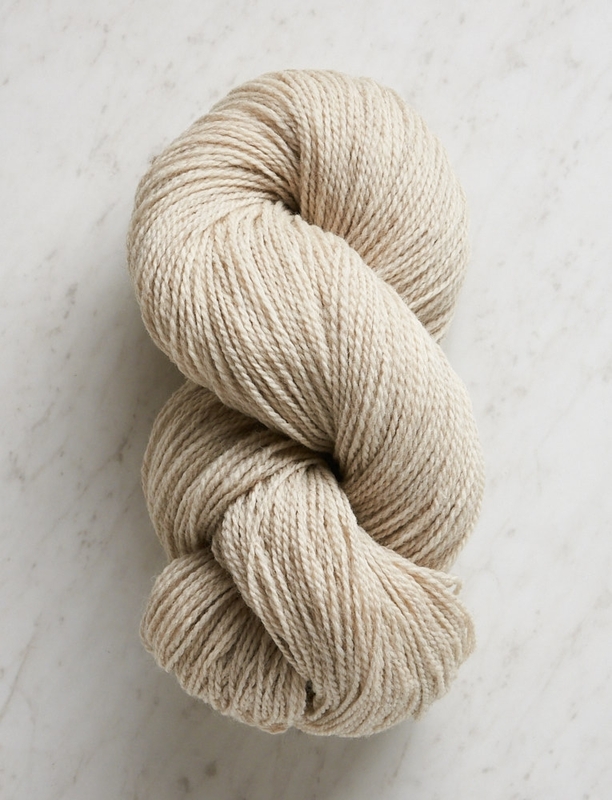 Knit up in our Good Wool, we love that this yarn is super affordable but also that its undyed natural beauty is reminiscent of a classic fisherman’s knit… without the traditional itch. Good Wool also has amazing loft and stitch definition, making each detail of the Hawley distinct and truly lovely! Designed for Purl Soho by Julie Hoover. 4 (4, 5, 6, 6, 7) skeins of Purl Soho’s Good Wool, 100% Andean Highland Wool. This is the color Winter Grass. To fit chest circumference 30-33 (34½-37½, 39½-42½, 44-47, 48½-51½, 53-56) inches, with approximately 4-7 inches of ease. 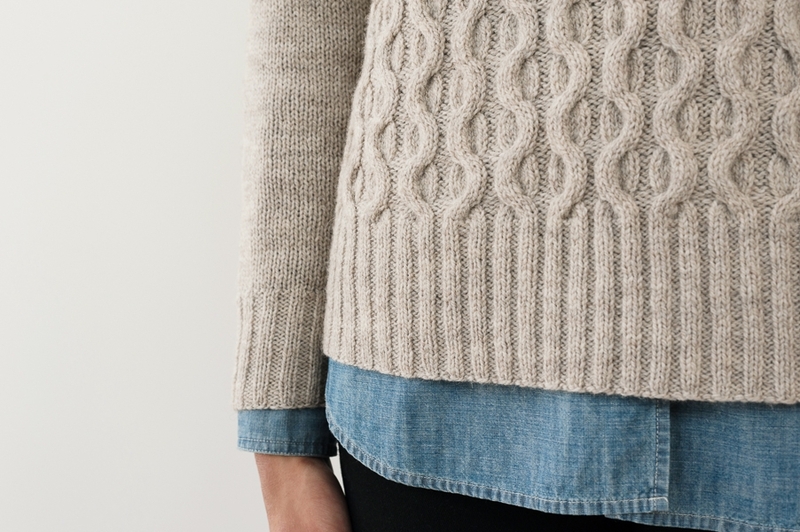 SAMPLE: The sweater pictured here is size 41½ inches modeled with 7½ inches of ease. Hawley is available as either a hard copy or download. When will this be added to Ravelry? 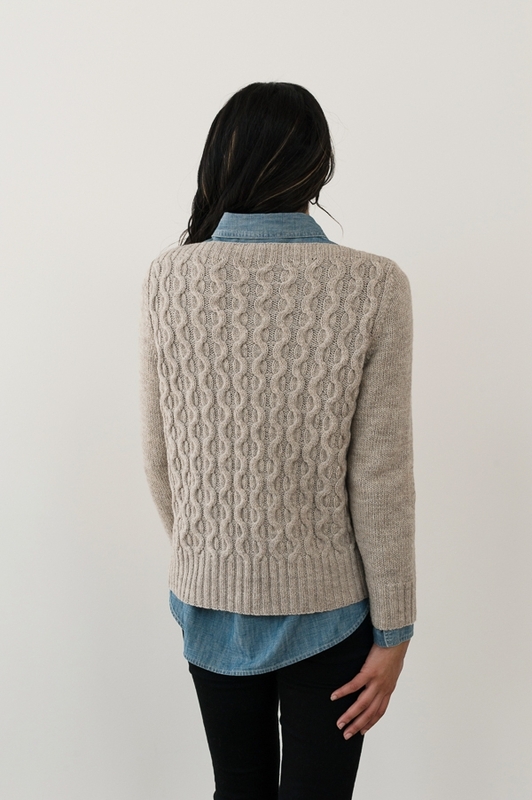 Will Purl soho have kits for the pattern+ yarn in the future? Great question! While we do not have kits for this project, we sell all of the materials that you will need to make it! 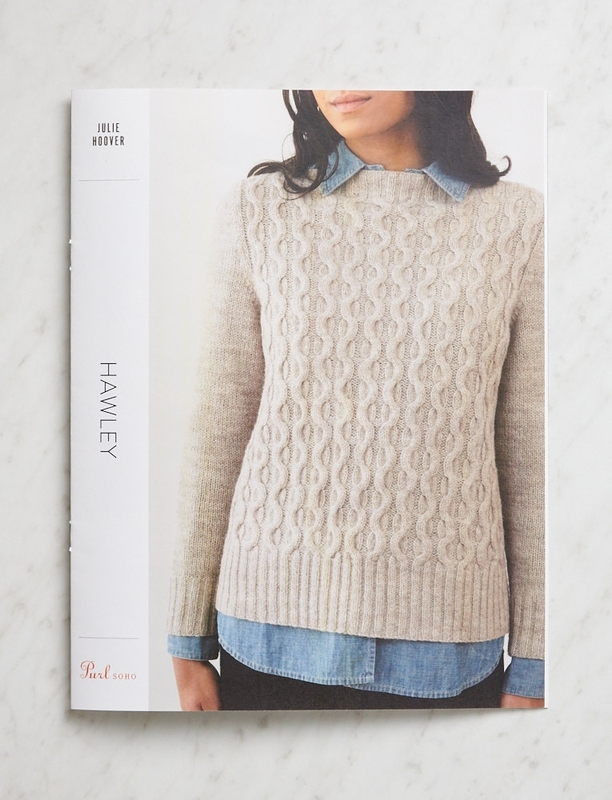 I bought the Good Wool yarn and am knitting the Hawley pullover. I’m knitting the size that required me to cast on 178 stitches. I’m working the back and the pattern says to knit the cable pattern until piece measures approximately 16 1/4 inches ending with row 6 of the pattern. I’m at 16 1/4 inches at row 12 of the cable pattern. Should I stop here and begin the armhole shaping? Or should I continue on which would mean that I would start the cable pattern again and knit to row 8 and have a piece that measures more than 16 1/4 inches? Thanks for your help! Thanks for writing in! 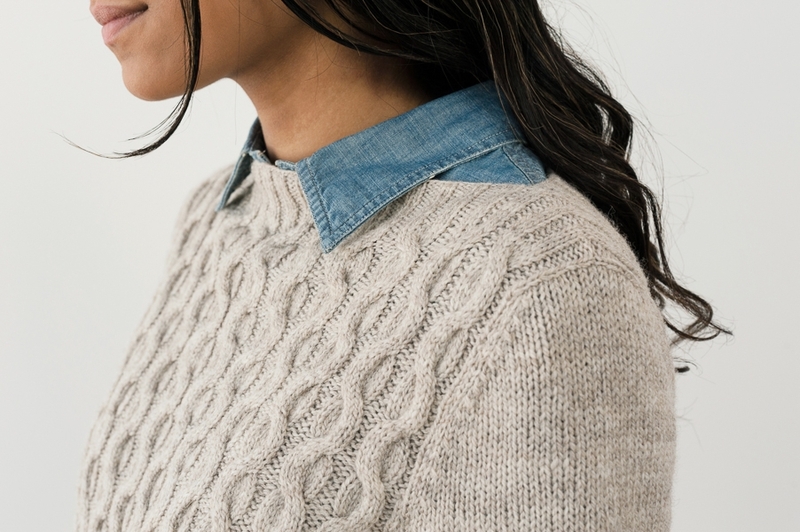 This entirely up to you – if you don’t mind your sweater being a little longer or shorter, the easiest thing to do would probably be to either continue for 8 more rows or go back to row 6. Looking ahead at the pattern, I suspect you need to end on a specific row of the cable pattern so that you can then also end on the correct row of the cable pattern before working the neckline ribbing, but if the reason you didn’t end on the correct row is that your row gauge is off, you will also probably not end on the correct row at that time. If that is the case, the best (and scariest!) approach is probably to just begin your armhole shaping now, and be aware that you will have to wing it a bit at the neckline. 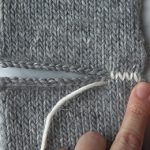 If your blocked row gauge is correct in the cable pattern, then you should definitely make sure you begin your armhole shaping on the correct row and then block your piece to the correct measurement when you are done. Cute pattern! Any chance a person could use linen quill instead of good wool for this pattern? I’m loving the new yarn colours in linen quill, as I already have numerous grey and brown sweaters. Thanks! Thanks for writing in! Great idea – although you would have to do a gauge swatch to be sure, I do think that Linen Quill held double would be a fairly close match to Good Wool! 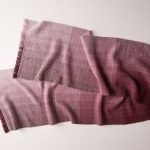 Hawley would also be lovely in Cashmere Merino Bloom or Flax Down for some additional colorful options! Best of luck and please let us know how your sweater turns out! Is there a washable wool you could recommend for this project? Hoping to make this for my daughter. Thank you for reaching out! Anzula’s Cricket is a machine washable yarn that has the same gauge as our Goodwool. I am in the process of knitting the Hawley sweater. Please tell me that once blocked it will fit to size? Because right now, it looks quite narrow in the body, but I am hoping that it looked like for you as well and that the cables will flatten out a bit. Thanks for writing in! Although cables do usually block out somewhat wider, it is hard to say if your sweater will fit unless you knitted and blocked your gauge swatch! On the last page of the pattern you will see two separate gauges, one for stockinette and one for the cable pattern, both given as blocked measurements. If you are in doubt, you could always put what you have done on a piece of scrap yarn and block it to measure your gauge and the overall size to make sure it matches the dimensions in our diagram! Hi, I’m a bit unclear on one of the directives in the Hawley pattern. I’m currently finishing up the first sleeve and I’m up to the part where I need to bind a specific number of stitches in the beginning of the next two rows. Does the phrase “the next two rows” refer to the Cap Decrease row on the right side and then the stockinette stitch row on the wrong side? Or am I missing something? Also, is there a preferred bind off method for these stitches ? Thank you for reaching out! This is a great question. You will be knitting these two rows in established patten and then begin your Armhole Double Decrease Row. I would reccomend a standard basic bind off for these stitches. I hope this clears things up and let us know if you have any further questions.